San Giuseppe Prega per Noi—St. Joseph Pray for us! The Feast of St. Joseph was celebrated throughout Italy and the entire world on March 19. The weather in Rome started with hail at 8:00 in the morning, followed by strong rain for several hours. 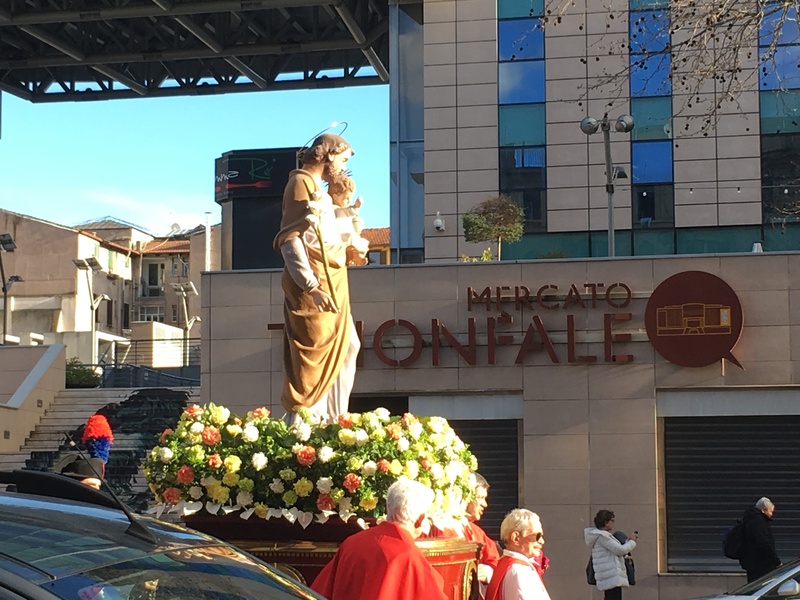 Yet at 3:30 in the afternoon when clergy, religious, parishioners, pilgrims, and visitors gathered in front of the Basilica Parrochiale of San Giuseppe Trionfale in Rome the sun started to break through. As the statue was carried outside to be the focal point of the procession, the sun shined so very bright that sunglasses were needed. The procession was led by the Band of the Gendarmeria of the Vatican and presided over by His Excellency , Monsignor Paolo Ricciardi, Bishop for the Pastoral Care of the Diocese of Rome. This beautiful procession started at the Basilica San Giuseppe Trionfale and continued through the neighborhoods of Prati and Trionfale with deep devotion, prayers and singing by family members of all ages and anziani (respected, revered older senior citizens), young people, babies in strollers, children on the shoulder of their fathers, little children making the sign of the cross and praying along with their parents and nonni (grandparents). The prayerful group extended to at least seven city blocks in length, and concluded at the parish where Mass was held. This parish conducted a program for three days prior to the Solemnity of St. Joseph which included prayers, Masses, a bicycle event for the entire family and community, music and theater in preparation for this feast day. Later in the evening the sound of fireworks could be heard throughout Rome in celebration of this feast day. St. Joseph is the patron saint of many causes, especially fathers, families, married couples, children, pregnant women, workers, craftsmen, against doubt, the dying, and a happy and holy death. He is also the guardian and protector of the Universal Church. He has two feast days: St. Joseph the Husband of Mary on March 19th, and St. Joseph the Worker on May 1st.